Byron shire mayor Simon Richardson says a legal bill for ratepayers of more than $100,000 incurred by council fighting an injunction to stop the controversial rock wall at Belongil represents the ‘cost of democracy’. Environmental group Positive Change for Marine Life this week withdrew its bid in the NSW Land and Environment Court to halt the Belongil interim access stabilisation works being undertaken by Byron Shire Council, after failing to convince the court to grant an interim injunction. Cr Richardson told media that ‘if you believe in people’s rights to seek justice in a court, then you’ve got to take the negative along with that, which in this case is pretty rich legal bill for a couple of months’ work, so the only people who benefit is the lawyers’. Council’s legal services coordinator, Ralph James, welcomed the outcome, saying construction works would continue as planned. ‘While we are pleased that the matter is not going to proceed before the court, unfortunately council has incurred significant legal costs of well over $100,000 through defending a case that council successfully argued had little merit,’ Mr James said. Last month, the marine-life group lodged the legal challenge to try and stop the works going ahead without an environment impact statement. The Byron Shire Mayor says there is nothing temporary about the rock wall that will be built on the Belongil Spit. The council today voted five-four in support of plans for an interim rock wall to combat erosion at the end of Manfred Street. The motion was debated and voted on in confidence for commercial reasons. This morning’s public-access sessions featured some rowdy exchanges between opponents of the plan and pro-development councillors. Simon Richardson said there was nothing temporary about putting large rocks on a beach. “Since there’s not one recorded case in Australia’s history of rocks being created as a wall on a beach and then taken back,” he said. Catherine Coorey, from the Byron Residents Group, accused the councillors of failing to follow proper process. She said the decision should have been delayed until a coastal zone management plan is delivered later this year. Ms Coorey said it was a decision which could have major financial and environmental repercussions. “The science would seem to suggest that if the rock wall is there, then the sand in front of it will disappear and eventually there will be no beach,” she said. “If people want to keep that beach then they’re going to have to pump sand, and people are very wary about pumping sand from our surf beaches. “What they’re looking at is something that will affect all of Byron’s beaches potentially, and also possibly commit council to a long future of massive expense. But Byron Shire councillor Diane Woods has scoffed at suggestions the decision should have been delayed. She said no-one really knows when the coastal zone management plan will be finalised. “We were supposed to have it completed by June,” Cr Woods said. “Certain people in council are wanting to push it out well past next year and perhaps right into the next election. “[They are] probably thinking that there might be an opportunity there to get a council of a different ilk who may well be looking at planned retreat. “In other words tossing everyone off the Belongil Spit. “I think [the rock wall] is a fantastic idea and I’m so glad that we’ve finally got to this stage after many, many months and many attempts to try and circumvent this happening. “All we’re doing is actually completing a rock wall that already there of about 110 metres. Byron Shire’s pro-rock wall councillors hope they can rush through a coastal zone management plan (CZMP) in less than two months, although no draft has yet been drawn up more than three years after it was first mooted. The plan has been mired in delays since the state government first called for it in October 2011. Then environment minister Robyn Parker ordered the CZMP to be in place by June 2013 and extensions were later given until June 2014 – and then until June this year. But in March, then minister Rob Stokes told the Coastal Councils Conference that guidelines may be changed after 30 June this year and that councils still with outstanding CZMPs at that time may have to re-frame their drafts to fit them. Byron Greens Cr Duncan Dey believes the deadline is now unachievable but one of the biggest supporters of rock walls in the shire, Cr Sol Ibrahim, told Echonetdaily that it may still be met. That is despite the Office of Environment and Heritage throwing out the council contractor’s cost benefit analysis (CBA) of rock walls versus the council’s existing policy of planned retreat. But rather than accept the OEH’s offer of help to redraw the CBA, Cr Ibrahim and the pro-rock wall faction voted at last month’s council meeting to give more money to the same contractor to redo the job. At time of writing the contractor still had not estimated how long it would take to complete. Despite this, Cr Ibrahim told Echonetdaily believes the development of at least a draft CZMP is still possible by the June 30 deadline and to this end council staff have inserted two late reports relating to the matter in today’s council agenda, one of which would establish a project reference group (PRG) that would ‘guide’ the development of the draft. Cr Dey has lodged a formal objection to the move. ‘With everything we’ve been given there’s not one word about why it has to be dealt with on May 1,’ he said. ‘I’m offended I have to deal with it without the public knowing about it. There’s no announcement [by council] that these late reports have been published,’ he added. He put a motion the last council meeting to ask the state government for a further extension which was defeated by the pro-rock wall majority. ‘The un-health of the PRG’s operation is best illustrated by clause 5 of its proposed Constitution: if the councillor who is appointed chair can’t make it to a meeting, they ring in from their death-bed or wherever and determine the replacement chair for the day. This is unheard of in local government,’ Cr Dey said. But he did leave the door open to the members of the panel being selected by council rather than, as is proposed in the draft constitution, by the group itself. 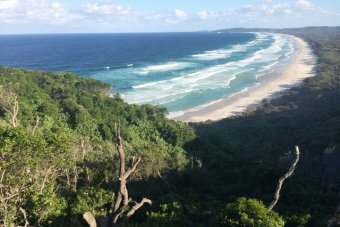 Plans to build a protective rock wall on the Belongil Spit could lead to sand being pumped from Tallow Beach, on the other side of Cape Byron. 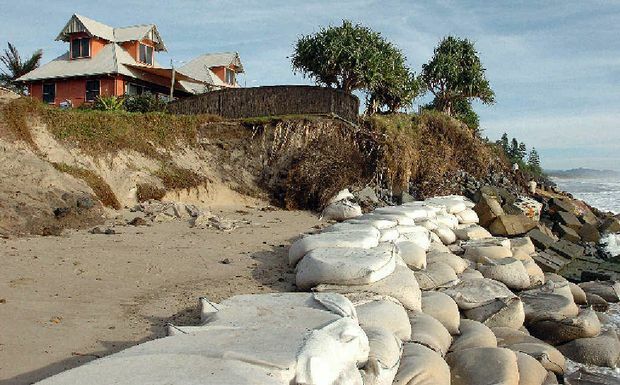 The local council recently voted to go ahead with the controversial rock wall, which is designed to protect beach-front homes from erosion. Mayor Simon Richardson said the existing Belongil Beach will be lost unless sand supplies are replenished. He said one way to do that would be to pump sand from Cosy Corner. “The Office of Environment and Heritage has basically stated their position that rock walls shouldn’t be built along Belongil unless a system like this is place,” Cr Richardson said. “Not because they necessarily support a system like this, but they don’t want to lose Belongil Beach. “If landowners are going to put walls in front of this marine area, we need to do something to protect it. “So there are a lot of discussion to be (had). “To me the vast majority of (the options) are quite unpalatable to the community. But another Byron Shire councillor has defended the rock-wall plan. Cr Diane Woods said it was ridiculous to suggest the beach at Belongil would be put at risk. “There’s plenty of beach there with the existing rock walls,” she said. “The problem is with the tiny bit that’s not done there is a risk of a break through there, which would have a massive impact on the whole of Byron. “We’re not doing anything new here. “We’re just completing a rock wall that’s almost completed, only there is about 100 metres of it to do. “It’s ridiculous to say that we’re going to lose the beach because we haven’t lost it yet. “You’ve got a home there and you want to protect it, you should be able to take those measures that can be done without making any massive impact upon the amenity of the beach for other people. “It’s a no-brainer in my view. BYRON Shire Council is caught between a rock wall and a hard place in determining how to best proceed with its Coastal Zone Management Plan. 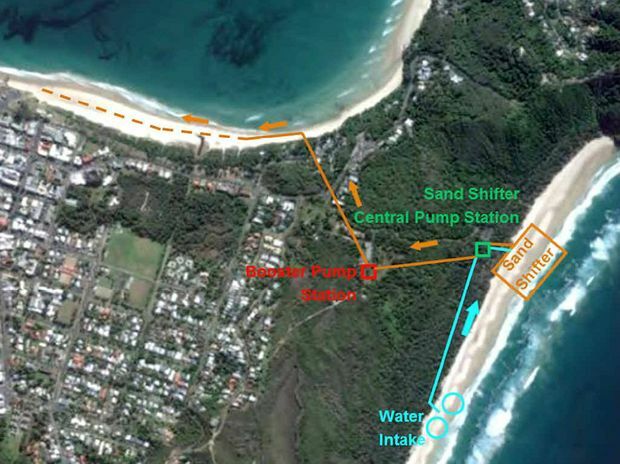 A controversial plan to pump sand from Cosy Corner at Tallow Beach across to Clarkes Beach has been included as part of a report from consultants Water Research Laboratory (University of NSW). It is just one of the options on the table as council grapples with how to protect its iconic beaches and built up areas from future storms and sea level rises. Mayor Simon Richardson said “the average person would be horrified by the thought” and that it would be “unpalatable to the community”. “The idea of taking thousands of metres of sand from that iconic surf beach, over the National Park to Clarkes goes counter to what I think is the prevailing environmental feeling in our community,” he said. The council recently approved an interim rock wall to be built at Belongil while it goes through the process of preparing its Coastal Hazard Management Study and Coastal Zone Management Plan. The options before the council are to maintain their current Planned Retreat policy which has been in place since 1988. Essentially it requires owners to remove houses built after 1988 when the sea is lapping on their doorstep. Another option is to fix the exiting rock walls and fill in the gaps to protect existing houses. If that option is pursued, additional engineering work will be needed to capture or replenish sand that would otherwise be washed away. Cr Richardson said the options include a series of groynes – rock walls that would run perpendicular to the beach to capture the sand as it moves north from the lighthouse – or one big groyne that could be positioned at the mouth of Belongil Creek that would be similar in size to the rock wall at Brunswick Heads. Initially the Office of Environment and Heritage would not support the construction of a rock wall at Belongil unless there was an approved sand nourishment program in place to offset erosion. However, residents approached Environment Minister Rob Stokes who over-ruled that decision so construction can go ahead without the need for a sand transfer scheme to be in place. 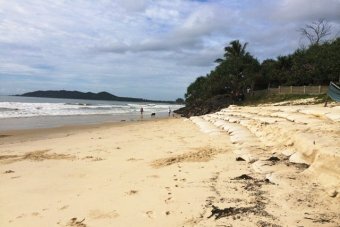 But it is estimated that a system to pump sand from Tallow Beach would cost around $2 million to build with an annual running cost of $300,000 – $500,000. “So the question is who is going to pay for it? Particularly the ongoing running costs,” Cr Richardson said. The Office of Environment and Heritage had offered to do an independent cost-benefit analysis of all the options but this was voted down at the last council meeting. 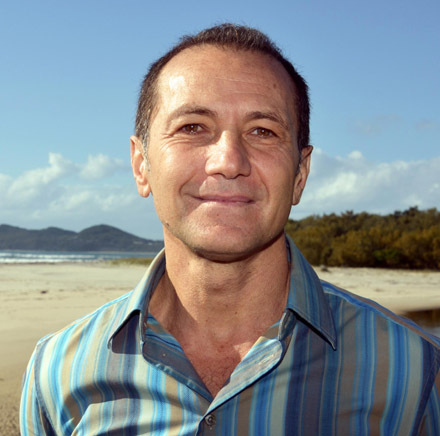 Byron Shire mayor Simon Richardson has lashed out at fellow councillor Sol Ibrahim after he pushed through a motion last week effectively rejecting an offer by scientists and economists to help the council manage the Shire’s pristine coastline. Instead the council will pay more money to a contractor whose draft cost benefit analysis the state government has already rejected, a move that will push the long-awaited Coastal Zone Management Plan even further behind schedule. The strategy could also see the potential erosion of Belongil Beach, one of Australia’s most iconic surfing beaches. And with the support of Crs Wanchap, Cubis, Woods and Hunter, Cr Ibrahim also rejected an offer by the NSW Office Of Environment And Heritage (OEH) to redo a cost benefit analysis for the planned Belongil rock wall at no cost to council. As reported in The Echo previously, the Belongil rock wall project aims to protect high-priced sand- dune real estate, specifically three private properties and some Council-managed land. But it’s over budget, has been kept secret, is close to losing state funding and has been criticised by expert scientists who deal with coastal planning. Additionally, no contribution offer has been publicly announced by the landowners, making the cost to ratepayers unknown. Nearly $22,000 of public money was splashed at the project last week, earmarked for lawyers and consultants. That adds to the estimated $142,500 already spent since January. Apart from funding the project, there are expected upkeep costs of ‘nourishing’ the beach with imported sand to prevent depletion. As for the offer of help from the OEH, Cr Ibrahim claims that the department is trying to take ‘control of the process’. ‘The advice from the OEH has been heeded, and will inform the revision of our cost benefit analysis by the consultants,’ he said. Meanwhile, Council’s director of sustainable environment and economy, Shannon Burt, says the coastal zone management plan (CZMP), which outlines coastline management, is unlikely to meet the June 30, 2015 deadline. The rock wall project, entitled Coastal Hazard Management Study Byron Bay Embayment, was also a ‘key part of the CZMP’. A spokesperson from the NSW Office of Environment and Heritage explained that funding for the ‘interim protection works at Belongil Beach was subject to the submission of a draft design that satisfied the NSW Coastal Panel and relevant state agencies, including OEH, and grant requirements’. They told The Echo that OEH had, ‘concerns with the proposed design related to the scale of works, impacts to public safety, beach access and amenity. ‘Cr Ibrahim and his supporters don’t want the eyes of the NSW Office of Environment and Heritage (OEH) over it. I do,’ he said. ‘OEH have rightfully been appalled with the interim wall fiasco and are concerned about our economic modelling, which was clearly biased towards a rock wall “solution”. He queried what expertise Crs Ibrahim, Wanchap, Cubis, Woods and Hunter had in the field. And dumping large rocks on beaches has also attracted criticism from another expert in the field; retired coastal engineer and long-time resident Andrew Winton-Brown addressed council on Thursday and asked them to explain the secrecy and cost benefit analysis. He said, ‘Estimated to cost up to $3m to build and $800,000 per year to run, has this plan been factored into any of the analyses of the options particularly the environmental, social and tourist impacts of building such a system at a popular surfing beach and within a national park? Have National Parks and the Arakwal people been consulted as stakeholders? ‘Once the CZMP legitimises the rock walls, they still have to be built,’ Cr Duncan Dey told The Echo. ‘None of the current structures are up to the standard that will be required. ‘Funding of the re-construction is therefore their next hurdle. Their desire is to have the state – ie the public – fund as much as possible. Not only are the capital costs critical, but the ongoing maintenance is a huge long-term issue. ‘I think the residents are ready with the capital to build new correctly designed walls but what they don’t want is twofold: to foot the bill for sand nourishment and to carry the responsibility for rebuilds after storm damage. Our science is clear: (1) there will be no sand in front of the walls after a decade or two unless it is imported; and (2) with sea level rise (and no beach), damage to the walls will become more frequent. ‘This is government in secret,’ he said. ‘The rest of the councillors are cut out of all of these plans, and it’s because our vote doesn’t matter. But Cr Ibrahim agreed for community input in the process. A community advisory/reference panel will be established; however, its terms of reference and influence are yet to announced. Belongil residents will ‘get their rocks on’ after Byron Shire Council on Thursday voted to go ahead with plans for an ‘interim’ rock wall on their beach against the advice of the Office of Environment and Heritage. 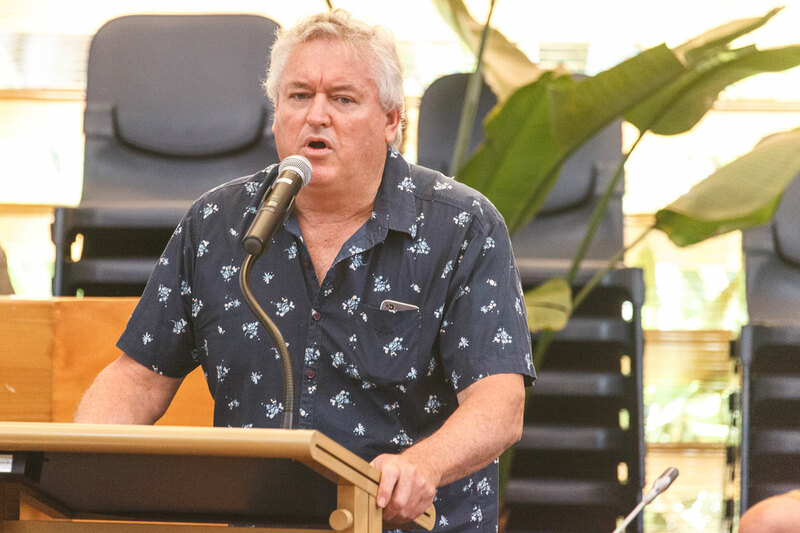 Thursday’s decision follows the rejection of a motion by Greens Cr Duncan Dey to put the project on hold until the council completes a long-awaited Coastal Zone Management Plan (CZMP), now due in June next year. But if councillors expected to receive any thanks from the affected landowners they had to think again. 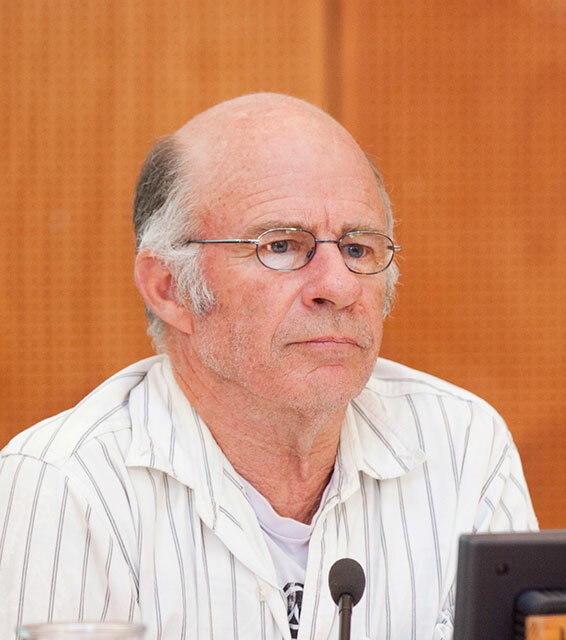 The plan’s largest advocate, Belongil resident John Vaughan, spent much of his allocated public access time railing against a legal agreement council had provided landowners to sign, describing it as a ‘40-page tome’ and comparing it to the ‘one-page document’ he had been provided in 2001, when a previous council was considering the issue. Echonetdaily understands Mr Vaughan is the only affected landholder still to sign the document, and ironically now the only impediment to the rock wall going ahead. Also speaking on the subject at public access was Karl Goodsell from Positive Change for Marine Life, who said there were ‘literally hundreds of examples from around Australia of dire consequences’ that had resulted from the building of sea walls. ‘A UNSW thesis written specifically on [Belongil] said that intervention can “interfere with and interrupt the natural processes”,’ he said. ‘If this [sea wall] goes ahead I predict there will be similar fight from residents further north within a decade,’ he added. Mr Goodsell’s speech received a round of applause and accolades from the gallery but did not sway a majority of the councillors. The move to hold off construction followed a series of letters from the Office of Environment and Heritage (OEH) this month, which spelt out to council staff that the the rock wall in its current design would not attract some $300,000 funding that it had previously promised. But OEH said that funding could still be available if council instead chose to first complete the CZMP and reconsider the design in that context. The carrot of state funds did not tempt conservative councillors, however, who defeated the motion with the aid of Greens defector Cr Rose Wanchap (Crs Dey, Richardson, Spooner and Cameron for). Cr Wanchap spoke against the motion, using a slide-show of the ageing geotech bags, which she said were ‘there one day and gone the next’ to bolster her argument. ‘There’s a very small distance between the beach and the estuary. If we have a breakthrough in the middle of a storm, the rest of the people on that spit will be in danger,’ she said. Cr Cameron raised the issue of alternative funding and said ‘we should give the community the opportunity to decide on whether to pay a million dollars for maybe six months’. He was also critical of the options for funding the wall provided by council staff. ‘There’s $398,000 to come from the infrastructure renewal fund, which is meant for potholes and parks,’ he said. ‘I see the employee leave entitlements reserve is also to be raided. ‘Pictures of geobags moving, shows they’re working. The bite is caused by the rocks. Where is it going to cut in? At the most sensitive area, further north, where the endangered shorebirds are nesting,’ Cr Cameron said. Under questioning from the mayor, infrastructure services director Phil Holloway said council had spent in excess of $2 million over 10 years on the existing geobag structure, ‘including repair and replacement’. He also admitted some batches of the bags used were considered to be too small for the job, which had exacerbated the problem. He added that new, larger sizes were now available but that geobags overall were ‘designed for small storms and small tides’. Mr Holloway said a new wall constructed in geobags instead of rocks ‘would cost around $600,000’. He was asked by Cr Dey how the sandbags would be removed to make way for the rocks. ‘I’m imagining I would just go down there with a Stanley knife,’ Cr Dey quipped, to which Mr Holloway replied it would be no easy task. ‘Some bags have compacted sand in them, which is not a simple matter to remove. The bags are designed so as not to be easy to cut. So it’s not just a case of cutting them and tipping out the sand,’ he said. Mayor Simon Richardson gave perhaps the most impassioned speech of his career in a last-ditch attempt to get the motion up. ‘This is a simple notice of motion to give credence to some sense of process and science,’ he said. ‘What’s changed now is OEH won’t fund it because the wall is way too big, unnecessary and will undermine the CZMP. He added staff had to use a loophole to get the proposal up at all. ‘This had to go through an infrastructure SEPP because rocks are not considered to be temporary. There’s not one case in Australia’s history where rocks were put on the beach and then removed. ‘We should acknowledge the OEH – that green extremist group – has withdrawn funding and said we should have a CZMP, and we should suspend it until we have a proper plan. ‘We should put process ahead of individual landowners and put science before spin,’ Cr Richardson said. But his pleas failed to win over the conservatives and the decider, disaffected former Greens Cr Wanchap. The motion was lost by one vote. A DECISION by the Office of Environment and Heritage to withdraw funding for the proposed beach works at Belongil has put the future of the project in jeopardy. 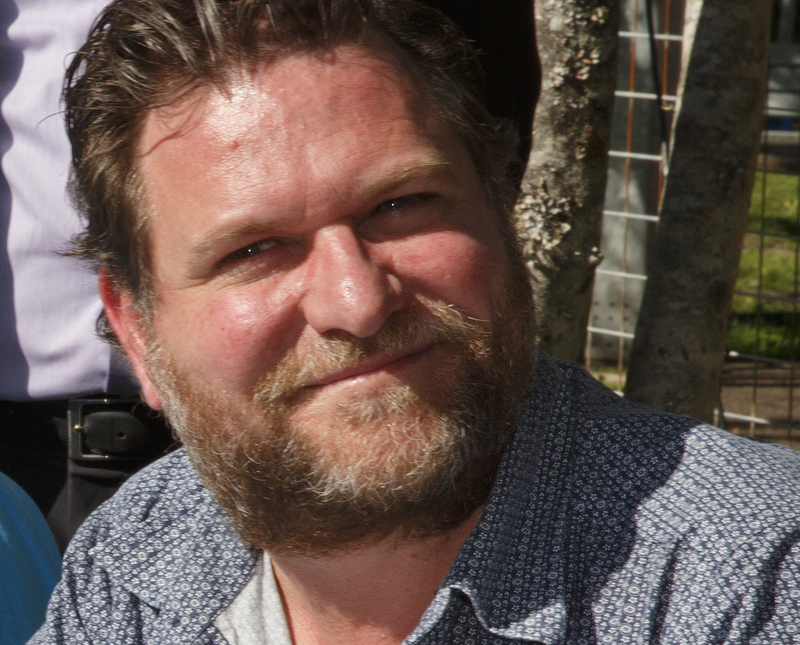 Instead of going to the Byron Shire Council’s October 30 meeting looking to take the project from the design phase to construction, the topic of alternative funding will now need to be considered, Council’s director of infrastructure services Phil Holloway said. “This [funding] could come from either property owners or from Council general funds and was yet to be decided,” he said. From last year the office had supported a funding arrangement seeing them match council’s contribution on a dollar-for-dollar basis for a $300,000 component of the beach works, he said. But the office said in a letter to council received on October 8, this funding had been withdrawn. At issue is the size of the interim beach access works that will help to stabilise the Belongil headland, at risk from sea erosion. The office said the scale of the works would have a significant impact on the beach areas of Belongil, and was the reason the funding had been pulled. The council has written to the office to understand what exactly the “withdrawal of funding support,” means for the project Mr Holloway said. “What we are unclear about is whether it is the whole funding amount or part, as the funding contract has been in progress for over a year,” he said. Council has not received payment from the office for part of stage one of the project which was submitted on January 29, 2014, he said. The loss of funding was a “concern” and could stop the interim works proceeding, Simon Richardson Byron Shire mayor said. Considering the Coastal Zone Management Plan could be completed and ratified by State government by Easter next year, it made sense to hold-off on a project that was only supposed to be an interim solution. The proposed interim break walls were always too big and the current situation should remain until the plan is finalised he said. 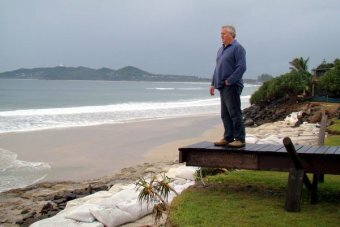 BYRON Shire Council general manager Ken Grainger has written to Prime Minister Kevin Rudd asking for funds to help with severe beach erosion caused by ex-tropical cyclone Oswald in January. Golden beaches having shown “minimal recovery” since the Oswald event. “Council is concerned that New Brighton is bordering on qualifying as an erosion hotspot,” Mr Grainger said. At New Brighton, The Esplanade, he explains, is now only 15m from the erosion escarpment in some places and many residents need the road to access their homes. The council “may need to consider options such as relocating the road if current conditions persist,” he wrote. The letter, dated July 18, will be tabled at Thursday’s council meeting and requests the PM assist the council with technical and financial support to prepare a coastal zone management plan (CZMP) for the area. Belongil; beach scraping at New Brighton, and preparing a draft CZMP for the Byron Bay Embayment. A PhD candidate from the Southern Cross University says beach-front property owners are on shaky ground if they think they have a common-law right to protect their homes. John Corkill says he’s been reviewing cases dating back to the mid-1800’s from Great Britain and Australia. He says there is clear evidence that coastal management in the public interest outweighs the rights of private property owners. “There were always big questions around whether landowners could claim a right to defend against the sea, or compel the Crown to do things to protect their land,” Mr Corkill said. “It became quite clear to me that there wasn’t a strong footing for this argument. 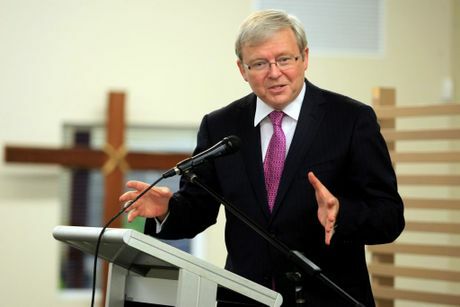 “Certainly when I looked at cases in Australia, the court has found that these rights don’t exist. “That’s really the ultimate conclusion of my research, is talking about rights, or old common-law rights from England in the 1800’s is really completely the wrong approach.